It reads like a poorly pitched film script – the kind studios would scoff at, and that a wary public would skip at the multiplex if it should somehow ever get made. It goes like this: one of the world’s biggest and most influential bands ends in a horribly violent suicide. Drummer emerges from the wreckage. He can both sing and play guitar. He releases an acclaimed debut under the guise of the Foo Fighters and before long, to all intents and purposes, takes over the world. Yes, it does sound ludicrous. But it happened. Unlike so many of his peers, Dave Grohl wears his artistic heart on his sleeve. The Foo Fighters’ early videos gave a nod to the celluloid excesses that bands like Roth-era Van Halen pioneered: ham theatrics, strained plot lines, a lot of dressing-up. With Probot he got to indulge his heavy metal muscle. He played house drummer for Killing Joke (a dream come true for a fan like Grohl) and Queens Of The Stone Age. He joined supergroups Them Crooked Vultures – in which he must have looked up from his drums and wondered when it was that John Paul Jones considered him a musical equal – and Teenage Time Killers, where the revolving door of collaborators included everyone from Brian Baker and Jello Biafra to Corey Taylor and Neil Fallon. It’s hard not to love Dave Grohl. No one’s having a better time than he is. He seems like the hard rock everyman who got lucky and sold out Wembley Stadium. His body of work belies that, though: he can be a considered lyricist, a crooner, an arena-rock screamer; he can rail against the world or give a history lesson; he’s a guitar hero who sometimes gets back behind the drums to remind you that it was his thunder that initially brought Nirvana’s Smells Like Teen Spirit to life. Perhaps there’s a measure of luck in his success, but that’s only because becoming that big will always take a degree of charm, and the right turn of the card. With his lop-sided smile and impossible fringe, he’s a songwriter who is constantly trying to push the envelope and somehow advance himself still. Here, we pick through the stand-out recordings from Dave Grohl's career. Thirty million sold and counting, Nevermind could be considered one of rock music’s poisoned chalices. Grohl never got full credit as a songwriter on the record, but it was what he and bassist Krist Novoselic brought as a rhythm section that helped make it so powerful, gripping and enigmatic. Although the Foo Fighters’ debut had promised much, few people anticipated the powerful step up that Grohl made with this follow- up. 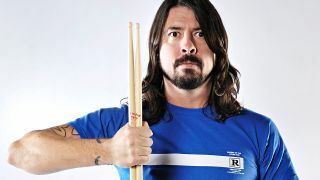 Even though he hired William Goldsmith to play drums, Grohl ousted him as soon as recording began. Gil Norton was brought in for his work with The Pixies, but the record was much tougher- sounding than them – slick, even. Floating around in demo form before Nirvana’s traumatic end, the first Foo Fighters album is a solo album of sorts – Grohl played almost everything on the record himself, with the exception of a guitar solo by Greg Dulli. And while it doesn’t hint at the stadium-eating band the Foos would become, it does showcase Grohl’s strong grasp of melody and memorable hooks. Sitting behind John Paul Jones and Josh Homme, it would be easy to get lost. But Grohl never disappears from view as part of this muscular trio, a bona fide supergroup which became more than a sum of its parts – little surprise, given that all three members were naturals at playing well with others. Josh Homme’s ever-shifting collective were anchored in their own universe by the time it came to record their third album. How else to explain the loose concept of a radio station playing the songs as if it were one long broadcast punctuated by an over-zealous DJ who made Murray Walker sound sedate? One can only imagine Grohl’s glee when he managed to green-light his own heavy metal project. Not to mention the dismay of his record company when he told them he was finally getting to duet with King Diamond. The all-star Probot gave Grohl a chance to live out his metal fanboy fantasies, giving him free rein to go back to his garage and beat the living daylights out of his kit. A poke in the eye for those who thought the Foos’ best days were behind them. Perhaps it was the reintroduction of Pat Smear (the Foos now have almost as many guitarists as your average southern rock band), or Bob Mould’s cameo on Dear Rosemary, or Krist Novoselic playing bass on I Should Have Known, or maybe even Nevermind producer Butch Vig behind the glass, but the band’s 2011 album had an energy that they’d lacked in the years running up to it. Bizarrely bringing in Adele and Sia producer Greg Kurstin (of indie poppers The Bird And The Bee), the mission statement for Concrete And Gold was “where hard rock extremes and pop sensibilities collide, [like] Motörhead’s version of Sgt Pepper”.